Ask almost anyone what’s on their travel bucket list and you’re likely to get the same answer: an African safari. This exotic land has captivated explorers for ages, yet today’s travelers can traverse the sweeping terrain while suffused in modern luxury. On an African Safari, stealthy hunters with cameras can bag an elephant or a lion from the safety and comfort of an up-to-date vehicle. Or they can view The Great Migration in all its untamed glory — thousands of gazelles, zebras and wildebeests dust up the savanna as they move in search of lush grazing lands. But for discerning guests of escorted tour companies such as Tauck and African Travel, Inc., this is just the tip of the iceberg. From the desert to the shore, from grasslands to mountains, from stark wildlife to sophisticated metropolises, these African Safari luxury tour companies can bring to their guests everything that Africa has to offer. Itineraries are as wide-ranging and diverse as the land itself. Depending on your preference your trip can focus solely on game drives and nature preserves, a true African safari. Or you can choose an itinerary with a broader view of Africa, including, but definitely not limited to, Cape Town and Johannesburg in South Africa, and the majestic Victoria Falls in Zambia. You can even add special excursions onto your tour; options such as a luxury train journey, a sojourn to the beautiful beaches of Mauritius or the Seychelles, or even a trip to Dubai or Egypt are available for those who wish to customize their vacation. Tauck Tours’ “Kenya & Tanzania: A Classic Safari” or “Tanzania: Serengeti to Zanzibar,” for example, are anything but ordinary jungle safaris. Yes, you will experience game drives and wildlife reserves but your chosen itinerary can include a day with Maasai tribe members, or an excursion to Olduvai Gorge, where some of the earliest human fossils were discovered, or a visit to an animal orphanage where local children are taught to take care of injured and orphaned animals. On either of these tours, you can take advantage of one of Tauck’s many “Tauck Exclusives” – in this case, a spectacular pre-dawn hot air balloon flight where you will watch the sun rise over the Serengeti plains, and then enjoy a sumptuous breakfast in the African bush. 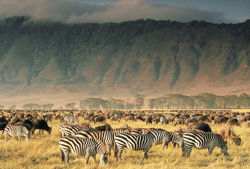 African Travel, Inc. also offers a plethora of plains tours that are anything but plain. Consider “The Pearl Of Africa.” Highlights of this tour of Uganda include an opportunity to get up close and personal with endangered Ugandan Mountain Gorillas, an exploration of the Bwindi Impenetrable Forest and a visit with an indigenous pygmy tribe. Or guests might opt for African Travel’s “A Luxury Safari & Tour – The Ultimate Safari” which includes tours of Cape Town’s beautiful Winelands and a Chobe River cruise aboard the magnificent Zambezi Queen. Perhaps your trip to Africa wouldn’t be complete without exploring the modern aspect of Africa. Both of these first-class operators have itineraries that include discovery tours to places such as vibrant Soweto, bustling Johannesburg and lonely Robben Island, where Nelson Mandela and others were imprisoned for decades. Sophisticated travelers want the best and will not be disappointed in the accommodations presented by both Tauck Tours and African Travel, Inc. Five-star luxury lodges and hotels, state-of-the-art transportation and exquisite meals are the norm. Key Traveler Africa Tour specialists can help you choose an African safari or tour that’s perfect for you. And after you return, you can cross it off your bucket list, but you will be left with amazing memories that will last a lifetime.